Virtual Reality arcades and lounges have been popping up like cutting-edge, disruptive-tech mushrooms over the past six months or so. Most feature variations of a standard layout - a series of cubicles, each one big enough for an adult to stand in the center and take one large step in any direction. The player wears a “tethered” goggle-and-earphone headset and carries two controllers for weilding the swords, shields, guns, paintbrushes and other tools necessary to play in virtual space. I was recently able to try one of the newest VR experiences, which does away with the tethers and cubicles in favor of actually moving around in a large physical environment. Zombie Survival is the name of the game, and it’s currently only available at a few US locations - I played at the Kalahari Resort in the Wisconsin Dells. The experience begins with a quick but thorough prep session, featuring live instruction from a human game controller - ours was a middle-aged lady with a strong Spanish accent, so not your stereotypical Zombie Hunting Coach - and a very slick video tutorial. After that you’re fitted with your headset, weapon and a backpack harness that carries a dedicated computer. The most distinctive features of the headset and weapon are the glowing, ping pong ball size trackers, which allow the computer system (and other players) to see exactly where you are in the game. You then proceed into the game arena, which is the closest thing to an X-Men-style Danger Room or Star Trek holodeck you’re likely to experience this year. It’s a large, dimly-lit space, about the size of an average restaurant in terms of floor-plan. Over your head is a grid that exactly matches the floorspace and which supports the hundreds of video cameras that keep track of your movements. There’s a hum and then the real world shifts into ... something else. You’re suddenly a soldier tasked with keeping a crucial urban area clear of marauding zombies until a rescue helicopter can touch down. The zone has been fortified with ad hoc barriers, but the zombies are starting to break through! Communicating with your team-mates via headset mics, you quickly plan your defensive tactics and spread out throughout the zone. One of the most fascinating features of this type of VR gaming is the cognitive dissonance between what your various senses are telling you. For example, the virtual world of Zombie Survival features a large, sloped ramp leading up to a raised platform, but in reality, you’re not walking up and down a ramp, just along a flat floor surface. I found that mildly disorientating, almost like trying to catch your balance on a ship in rough seas. There’s also a virtual elevator that can be used to travel between the two “levels”. Even through you’re actually just standing still, the illusion of being raised or lowered is amazingly convincing. Similarly, although you could walk straight through various walls and obstacles, you find that you don’t - partly because you don’t want to spoil the illusion, but also partly because the in-game illusion is so effective that it doesn’t really occur to you to do so. 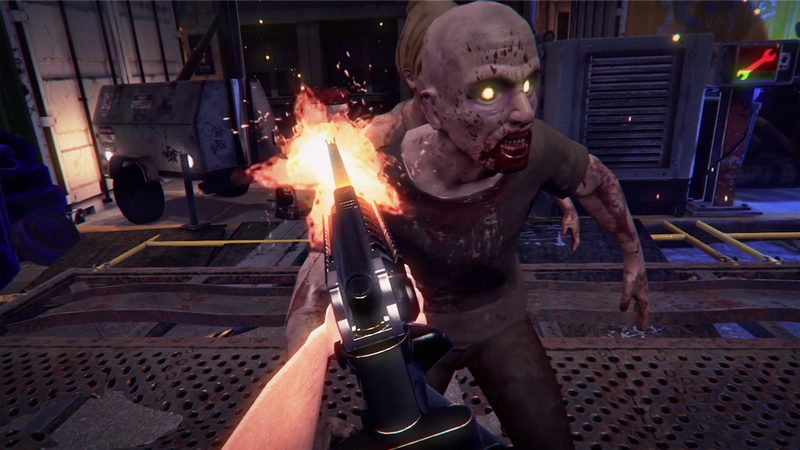 The zombies start out scattered and relatively easy to kill - headshots are, clearly, the best option - and you can switch your multifunctional weapon between several modes, including automatic machine gun fire, shotgun and (for some reason) sniper rifle. There’s also a reload button; I couldn’t find mine in the heat of the action, but fortunately the game system will auto-reload for you if necessary. As the game heats up, though, the zombies increase in size, speed and numbers and start to break past the barriers. “Checking your six” - constantly whirling around to make sure nothing is sneaking up on you - is a crucial survival skill in this game. The wildest moment for me was finding myself alone and completely surrounded by giant zombies at the ground level, having accidentally activated the elevator at exactly the wrong moment. By the time the rescue helicopter finally arrives and winches you to safety, you will have worked up a good sweat and will be totally exhilarated. In sum, free-roam, multi-player VR has finally arrived and it is amazing.